It's amazing how much more you can do in a single day when there is as much daylight as there is now. After work this evening I decided to go over to Silverwood Park in St. Anthony and was there for about an hour. Then a friend of mine called me to tell me that he had heard a Black-billed Cuckoo bird calling for about half an hour at Palmer Lake Park near the northeast side. So I left Silverwood almost immediately, though I was seeing both the male and female Indigo Buntings there. I got to PLP at around 6:00pm and went to the spot where the Cuckoo had been heard but I never heard or saw it. It was a little buggy already and I was getting bit up by not moving quickly enough. So I headed to the north end of the park where I heard a Yellow Warbler calling. I followed the sound until I found the bird in the same general area where I've been seeing them lately. With full leaves out now it is getting tougher to see the birds at all much less get photos of them. Finally it moved to the top most part which is when I shot this photo. A little while later I could hear another bird that sounded similar but more scratchy. 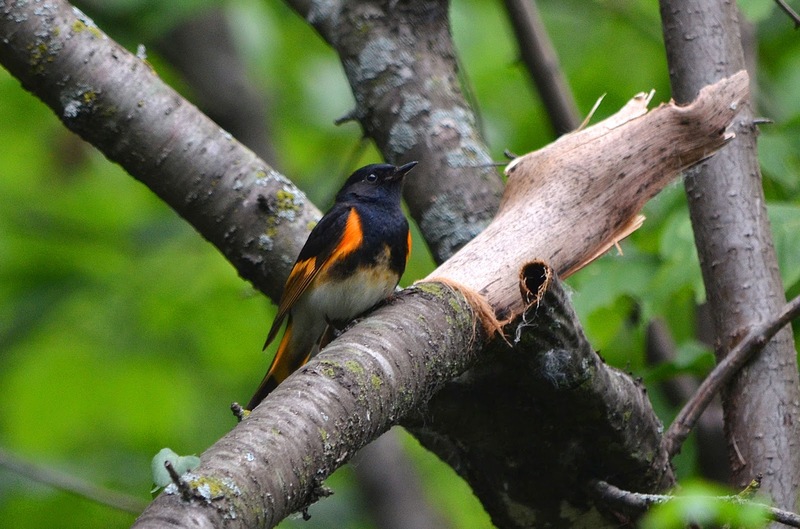 I wondered it if might be an American Redstart and indeed it was. The bird came down out of the treetops just long enough to check me out it seemed. It hopped around on a dead branch just long enough for me to take a few shots. Redstarts are notoriously hard to photograph because of their constant and quick movement, but I've found it is equally hard to take a photograph that captures the detail of their eyes and head. Since the males have a completely black head and black eye, it is somewhat rare to even be able to see their eyes. So this is one shot in my book that makes the cut! 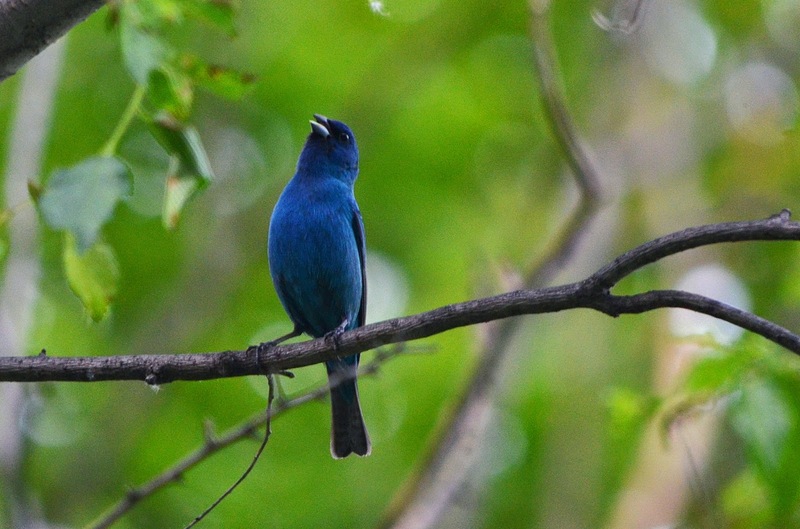 On my way along the north side I had been hearing not just one but up to three different Indigo Buntings calling from the treetops. If I would be lucky enough to see one tonight it would be the first IB's I've seen at the park this year. I decided to head back the way I came and on the way I did encounter one –a male. In fact, he gave me more than one decent photo opportunity as he busily sang out the same sweet, buzzy song over and over again. Like last year I witnessed him fly back and forth from one side of the trail to the next. After chasing him back and forth for quite a while I encountered him on a lower than usual perch and took this photo. It is lightened up quite a bit since it was getting darker already, but I really like how it turned out. I would not normally crop a photo so strangely, with all that space to the right but for some reason I think it works. 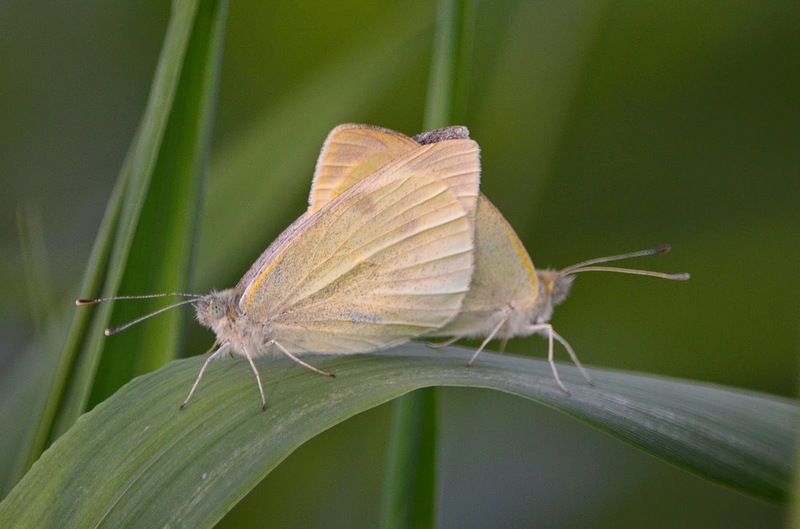 I saw one more interesting thing as I was heading back to my vehicle and that was these two Butterflies back-to-back with wings intertwined. These are a very common Butterfly and I believe they may be called "Cabbage Butterlies" but I'm not 100% certain yet. The odd position I found them in leads me to believe they were possibly mating. Today is June 21st and the first day of Summer which is also the longest day of the entire year. I made a trip to St. Cloud in the morning with a very brief visit to Munsinger and Clemens Gardens near the river. But by 3:20 in the afternoon I arrived back in the Twin Cities for a nice and long 2+ hour hike at the park. The flurry of spring migrant birds has been over for some time now, but there are a lot of other interesting things to see this time of year. After parking at the culdesac on 73rd Avenue and heading south, I ran into flooded trails that were just too deep to walk through. In 5+ years of hiking around the park, I think this is maybe only the 2nd time I've ever had to detour down Oliver Avenue and all the way down to 69th Avenue just to be able to make my way around the entire loop. But when I got back on the trail, I noticed this big Dragonfly just waiting for me to take it's picture against a nice green background. I had learned in the past year or so to count the number of spots or patches on the wings. 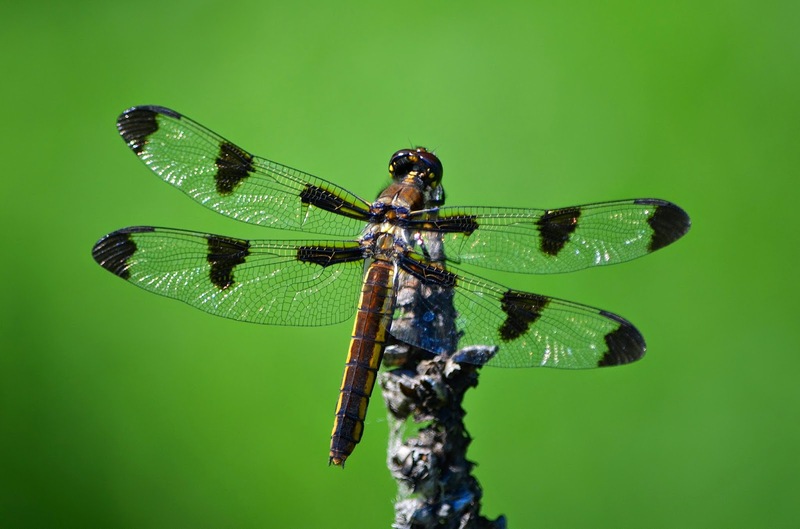 This one has 3 dark patches on each of it's 4 wings, making it a Twelve-spotted Skimmer. But what I didn't know is that you can tell it is a female. A male would also have white patches in between the dark patches. I think that is pretty neat! 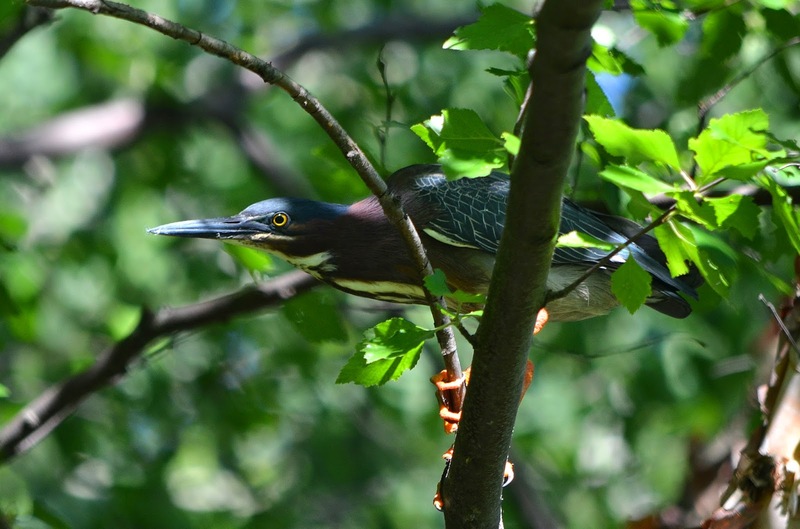 Shortly afterward I'd spotted a brief glimpse of a Green Heron who was perched quite low near the tiny little pond along 69th Avenue. I was bummed because he flew up from his spot right along the trail as I approached. But I saw where he landed and I decided to see if I could close again. He was hanging in the taller trees now on the other side of the pond and I was then able to kind of sneak up on him a little just because there were so many other trees and leaves in the way. Green Herons are a quite beautiful bird and can look slightly different each time I see them. This photo was taken right before he flew off again, but I really like that I caught his bright yellow eye in the sunlight! Probably the single most interesting sighting of my walk today came next as I spotted what first looked like a small snake in the bushes! It was mostly dark and with green stripes giving me the initial impression of a Garter Snake. But upon closer inspection it was quite a large Caterpillar. It was about 4 inches long with a bright orange head and also a sizeable orange spike on it's rear! I have never seen anything like it before. 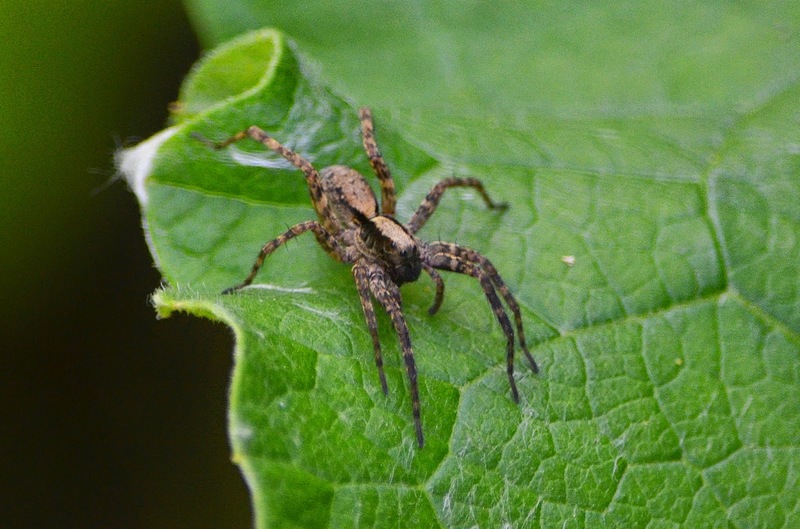 While it chowed down on a plant, I took quite a few photos hoping to ID it later on. And after someone pointed me in the right direction, I was able to narrow it down to a "White-lined Sphinx Moth" Caterpillar. There have been a lot of baby birds or "fledgelings" around the park lately. Some of these can be really tough to identify which species they are as they don't quite show the color or behavior that you're used to seeing in the adults. 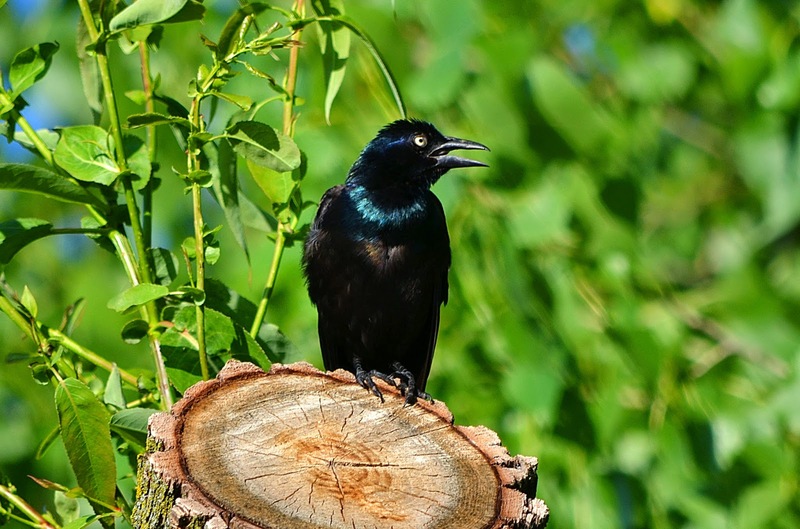 I saw quite a few young birds that I think were Common Grackles because they were surrounding an adult Grackle in a tree and begging for food. Then shortly later I spotted this one having a bath in the flooded trails on the west side. Adult Grackles have yellow eyes but this ones were grey. However you can kind of see hints of the iridescent purple/blue plumage already developing on it's head. The last item I want to share here today is actually a video, which I don't post that often. To my surprise, I again saw bird activity at the little tree stump on the south end of the park along one of the wood chip trails. I first noticed Black-capped Chickadees appearing to excavate an already existing hole in the very middle of this stump that was cut off at an angle. That was well over a month ago on May 5th! Today I could clearly hear young birds chirping inside the hole so I waited here for a bit. Sure enough a Chickadee came in with a mouthful of food and hopped down into the hole. So I tried my best here to capture a quick video. For whatever reason, the adult appears to leave again with the food still in it's bill, making me wonder if the young ones rejected it for some reason. Still this is pretty neat and is the first confirmed Chickadee nest I have found in the park. I was off from work this Monday and so I visited the park early at around 7:30am. 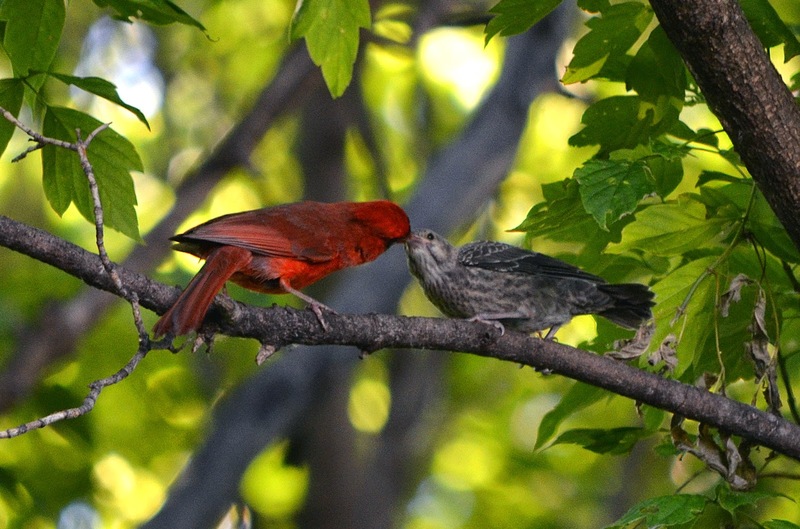 One of the first things I noticed was a bright red male Cardinal feeding what appeared to be a young one. But upon closer look I realized quickly that the young one was NOT another Cardinal. It was in fact a young Brown-headed Cowbird, a bird that is known for laying it's eggs within the nest of other "host" birds. I've read some about this odd behavior called "Brood Parasitism." Not only is it practiced by a few different species of birds, but also by fish and insects. The idea behind it is to let the unsuspecting host parents do the hard work of incubating, hatching and raising the young of another species. 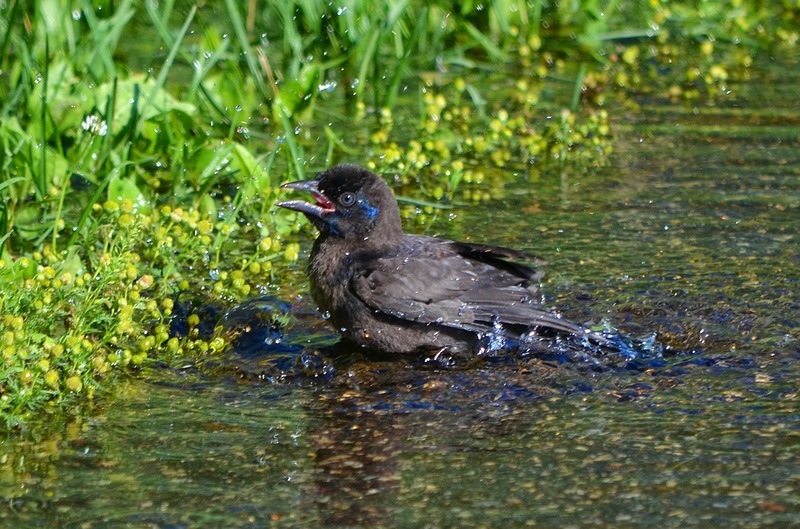 With Cowbirds especially, the infant cowbirds can be twice the size of the other birds, and will thus out-compete the others for food. They will likely survive while the bird's true offspring may not. Another strange wonder of nature. 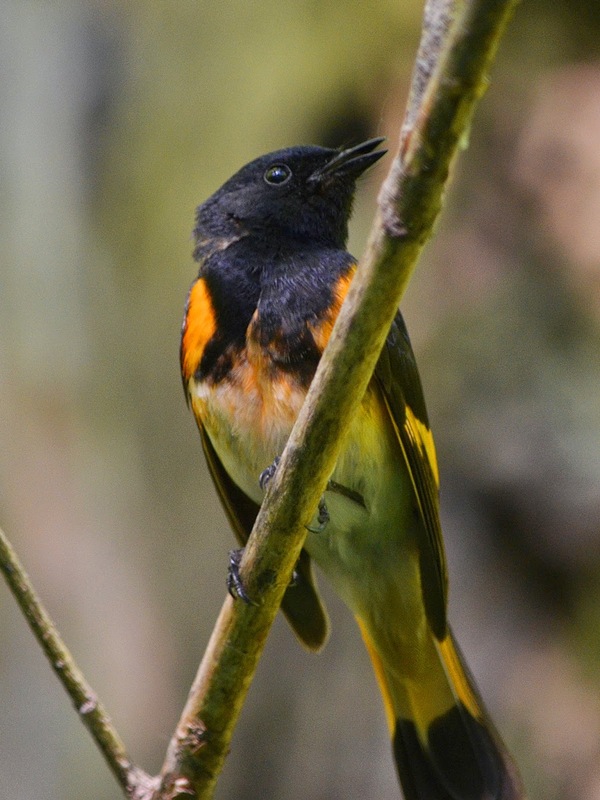 I had lots of good opportunities at American Redstarts today but they are a tough bird to photograph for sure. You need to take LOTS of photos in hopes of getting just one when the bird might have sat still for more than a nanosecond. This one turned out the best and then I cropped it vertically. I've recently discovered that I can sometimes get decent shots of bugs if I get far enough away and then crop the photos down later. So when I noticed this spider I gave it a shot. I actually hate spiders and have an irrational fear of them like many people. And this one was big too. No idea what kind it is and I really don't care to find out! About this time of year is when there are lots of different mushrooms and fungi growing in the park. Palmer Lake is especially good for mushrooms because of the wet habitat and especially because of the wood chip trails. There is one that I notice each year about this time and I always think it looks like and underwater coral of some kind. 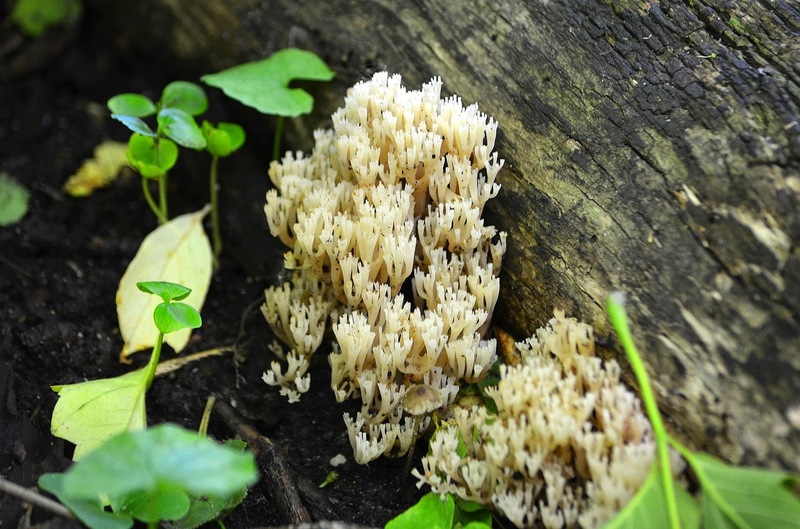 Reading about it now online it apparently IS referred to as "Coral Fungi" with a scientific name of "Clavarioid fungi." It appears whitish in color here but I've also seen it a deep yellowy-orange color and so I wonder if it may change color over time. Near the end of my walk I noticed one more very interesting insect. 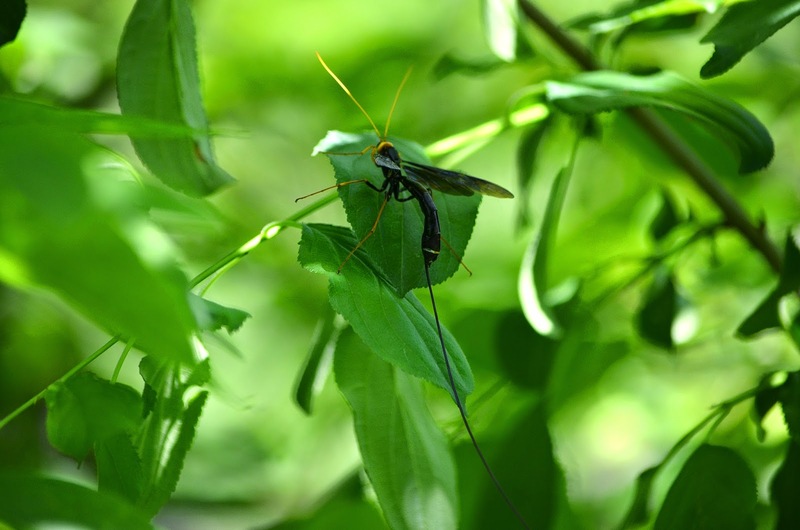 I've seen this one before and knew by the length of it's tail that it is the Giant Ichneumon Wasp. 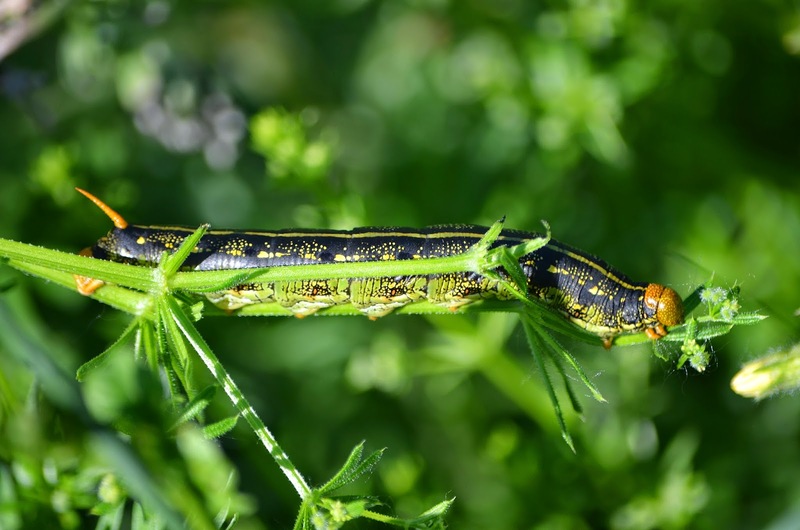 This "tail" which can be 4 inches or longer is actually an ovipositor used for laying eggs deep within tunnels bored by another species of wasp called the Pigeon Horntail. 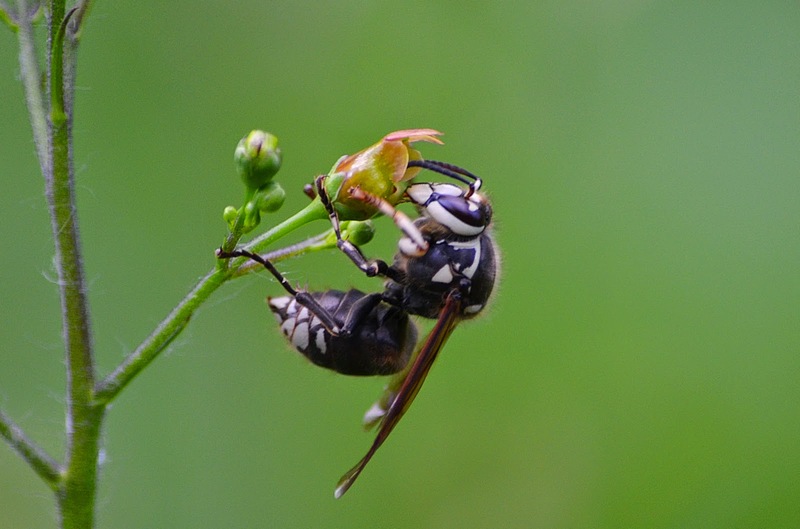 For this reason the Giant Ichneumon Wasp it considered to be "parasitic." My photo here doesn't even show the full length of it's ovipositor. As a kid I have a vague recollection of my Grandfather holding one of these wasps in his hand and it drilled it's ovipositor right into his hand! I don't quite now if that was completely true or just what I remembered. Regardless, I would not even think about trying to pick one of these up in my hand! I didn't make it to the park until just after 5:00pm this Sunday but there was still plenty of light left and lots of things to see. Upon arrival I noticed a Great Egret out wading in the flooded baseball fields on the east side. As of late I've been more interested in flowers and plants so I've also been trying to look down below me more often too. As I did I noticed this neat looking insect landing on a plant that hadn't even really flowered out yet. I don't think it is a Bee but rather some kind of Wasp, though I honestly don't know. It looked almost black and white. Later on the north side I climbed a little hillside to look around for Goldfinch but instead noticed a Flycatcher of some kind –likely a Least Flycatcher because of a very noticeable white eye-ring. 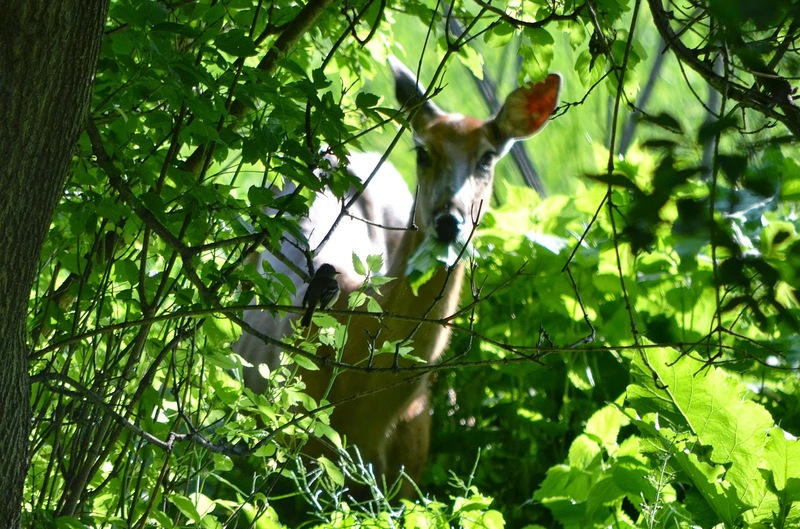 As I watched the flycatcher, a Doe suddenly walked into view right by the bird. This isn't the best picture but I thought it was funny and maybe the only photo I've got with both a Deer and a Bird in the same picture! Near the west side of the park I stopped to watch a Common Grackle picking up slugs out of a puddle on the paved trail. Like many birds with iridescent feathers, I'm always trying to capture the different colors one can see in them. After poking around the water for a bit, he flew up to and perched atop one of the freshly cut Willows that had been trimmed by the city. Near the end of my trip I noticed a brilliant purple flower growing near the cattails. I've seen this before but not paid too much attention until now. 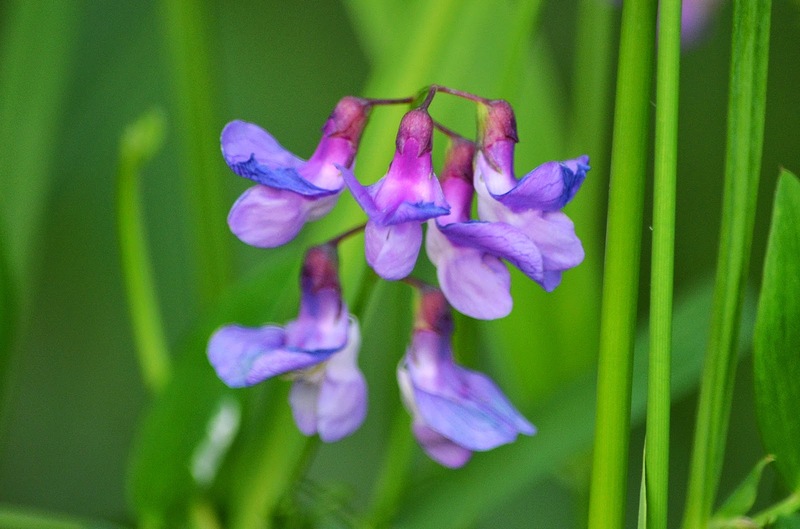 Upon looking up the flower later I learned it is called "American Vetch" and is in the "pea" family. I hope it is one that I can remember from now on. Other birds spotted today included American Redstart, Song Sparrow, Red-winged Blackbird (juvenile), Yellow Warbler, and a Killdeer who pretended to be injured when I approached! There are just some visits to the park I will remember for a long time and today was likely one of those. It was just such beautiful weather and with beautiful sights everywhere. 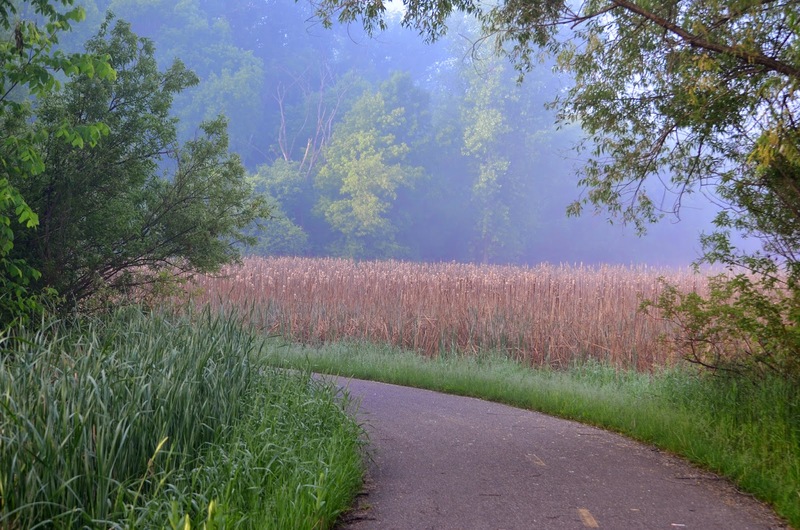 When I arrived just after 7am, there was a heavy blanket of early morning fog settled over the park. It made everything green feel even more so, like a jungle of sorts. It also made for some great photo opportunities and at numerous stops I would try to catch the rays of sun through the trees lighting up the fog. 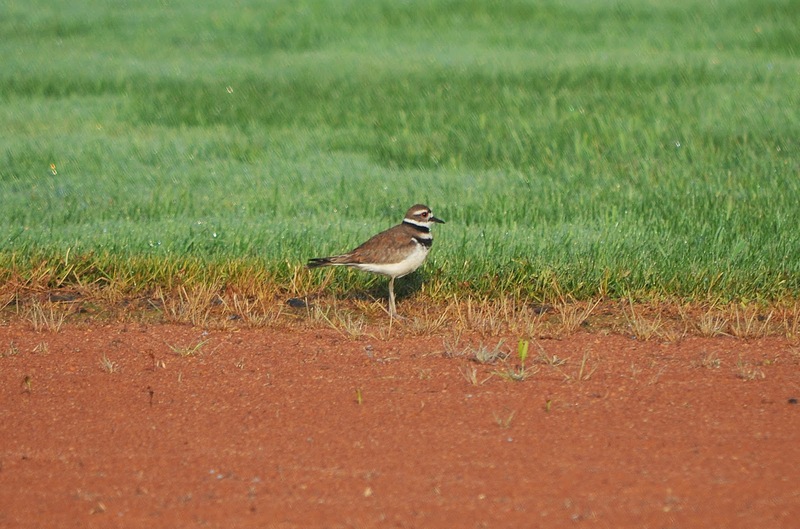 On the east side there was a Killdeer running around on the baseball diamonds. I was hoping the fog would let me get closer to it and for once I did come closer than normal. Still this photo is cropped in quite a bit. I'm kind of fascinated with them as I really only became aware of their presence at the park this year. Killdeer are considered a "shorebird" but can be found in some interesting places. I once saw one in the Burger King parking lot in Brooklyn Center! As the sun began to burn off the morning fog, it left a dew on everything. 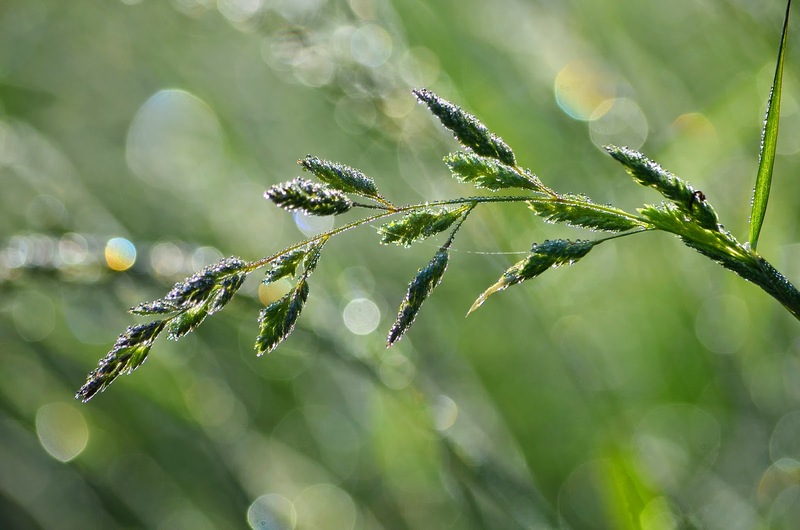 I liked how it was reflecting in the sun on this tall grass so I tried to capture it in a photo. 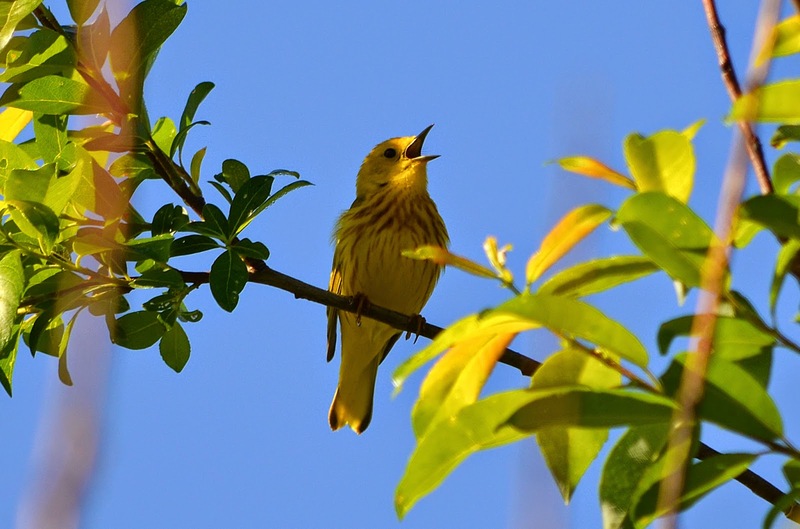 Birds of all kinds were easy to spot today but on the north side I ran into a Yellow Warbler who was singing it's heart out. 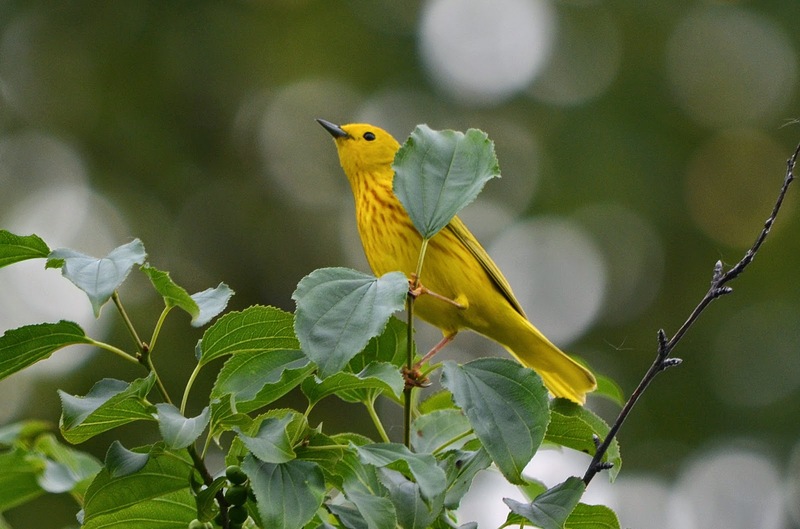 As with all Warblers, the Yellow Warbler can be tricky to get a photo of because they just typically don't sit still. But this one sat in the same spot for over 5 minutes just singing loudly. Periodically it would stop to itch it's head with it's leg which was an interesting sight and something you wouldn't think a little bird was even capable of until you see it. Near the end of my walk I watched another comical sequence play out on the paved trail in front of me. 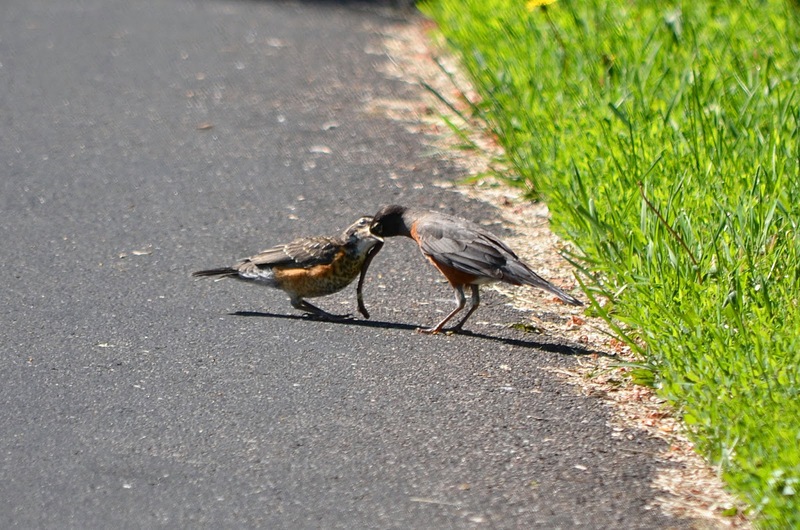 An adult Robin landed near a half-dead earthworm. Immediately a young Robin landed just a foot away. The adult looked at the young one, picked up the worm and proceeded to shove it down the throat of the young one. In one big gulp the worm was gone and the young one stood there again with his mouth open. I snapped photos every few seconds and thus caught the entire sequence which I posted to the Friends of Palmer Lake Park facebook page. In addition to the birds listed above, I also saw: Brown-headed Cowbird, Gray Catbird, Downy Woodpecker, Wood Duck, Red-bellied Woodpecker, Mallard, Canada Goose (the largest flock I've ever seen –nearly 75), American Redstart, Red-winged Blackbird, Eastern Bluebird, American Goldfinch, Common Grackle, Mourning Dove, Song Sparrow, and Baltimore Oriole. I also saw a couple of Painted Turtles crossing the trail.